These are the famous words I hear from my 92 year-old Popo (Grandma) every morning when I am back at home (Hawaii). She lives by having papaya every morning. Ever since I was a kid, I can remember her methodically spooning her papaya out of it’s “shell”. Bite by bite. When I ask my Popo what are the benefits of papaya. She’d sweetly says “it keeps me regular” and smiles. Current nutrition trends, have deemed fruits and most tropical fruits as “bad” or “unhealthy” because there is “too much sugar”. In this blog I’ll explore fruit, debunk some concepts about fruit and as always allow you the space to decipher how you’d like your relationship with fruit to be like. Fruits are loaded with vitamins. Vitamins can help us better combat bacteria, germs and improve our overall resiliency. Fruits have sugar. Sugars are a vital resource to help provide us with energy. We need energy (calories) to help sustain our activity levels, think clearly and manage stress. 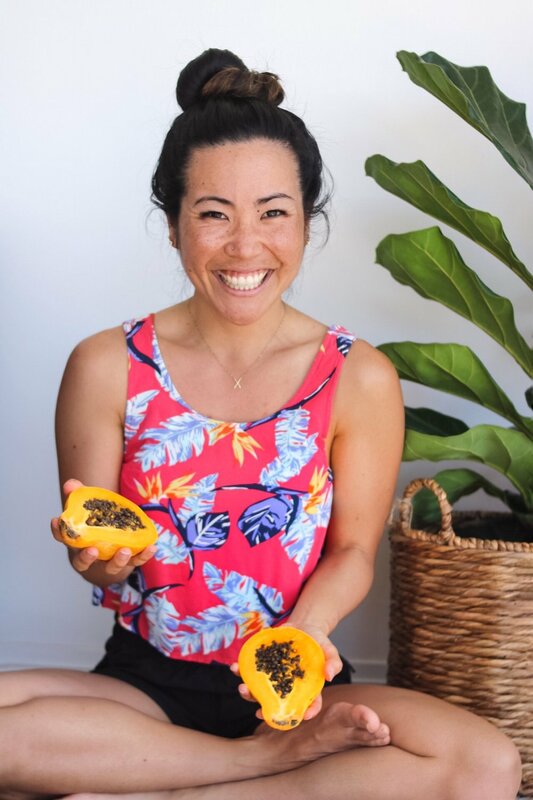 Tropical fruits like papaya, mango, and pineapple that I have access to here in Hawaii are locally grown, colorful, delicious, nourishing and rich in vitamins. At some point along my health journey, I started to eat less fruit because it was too high in sugars (I too, fell for diet trends that told me low sugar diets were the end all be all solution to “ultimate health”). I would swap eating a banana for a 1/4 cup of steel cut oats. I recall saying “no thank you” to my Popo when she asked if I wanted to split a papaya. Yet, the more fruit I cut out, the less satisfied I felt, the more anxiety I developed and the more cravings I had. I am a strong believer that we cannot cut out an entire food group and expect our bodies to feel respected, nourished or satisfied. Satisfaction can be self defined for each of us (*I’d encourage you to spend some time reflecting on the most satisfying meal you had, what did it look like? What tastes did you experience? Who were you with? What textures, temperatures and seasonings did you enjoy). Often times external pressures and an internal feeling that we NEED to remove fruit is what leads to drastic changes in our diets. We begin cutting out large servings (if not all) of fruit (whenever something is removed in an effort to change, please keep in mind that something needs to be added in in place. This goes for all behavior change efforts: ex. Intention: watching less TV; replaced behavior = taking a walk). Our bodies struggle with change because our brain perceives any large shifts as threatening to our survival. Therefore, the more 180 degree changes we make (diet, exercise, work, relationships, environments), the more stressful it can be for our bodies. Completely giving up fruit without a replacement plan, can leave our bodies feeing more stressed. And if the goal is “healthfulness”, our perceived efforts of removing fruit may be counterproductive. Tropical fruits, like mangoes and papaya have a plentiful serving of sugars. Sugars, that we need to provide us with the ability to think clearly, focus and multitask. Our frontal lobe uses up to 25% more glucose than the rest of our brain. The frontal lobe is responsible for our cognitive thinking skills, that of which includes willpower. This is one of the reasons why most traditional “dieters” fall off. When the brain is starved of glucose, we’re left feeling lethargic, foggy, with less energy to be compliant. Fruits are packed with vitamins, vitamins that help keep inflammation at bay. Chronic inflammation is the key contributor to all disease. A plentiful diet in fruits can help your body detox, heal and thrive in the ebb and flow. How would you describe your current relationship with fruit? In many scenarios, the fruits we’ve enjoyed as kids digest well for us as adults (ex. in my case papaya). The fruits that are preferred (our favorites) are also fruits that tend to work well for our bodies. Our “gut instinct”. It will take time to reintroduce fruits that may have been removed. It will take time to enjoy them guilt free. It will take time to figure out which fruits work well for your body. So, as always be patient with yourself as you embark on this journey. Oh and if you’re curious, my Popo was on point. Here’s to a fruitful 2019.